I went to Paradise Scrapbook Boutique http://paradisescrapbookboutique.typepad.com/ I had an idea for my January card class. Karen has beautiful BoBunny card stock and I think they will be perfect for the Paper Flower card. I wanted to get this posted because I want the gals in my card class to know they are going to have choices.....You can make your card in any of the colors that remain available...so come early. 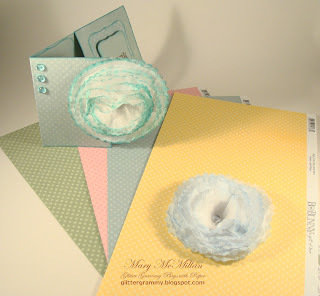 You will be making the flower, bring the chalk to match the card stock you choose. The flower was made using my scalloped Nested Spellbinder die. If you are interested in purchasing that die, or any of the Spellbinder dies, let Karen know. I'm off for a day with the girls. First it's Weight Watchers and then we are going to make the Christmas box I showed in an earlier post.